The medical community reignited a social media campaign against the National Rifle Association earlier this week after a gunman opened fire at Mercy Hospital and Medical Center on Chicago's South Side, killing an ER doctor, a pharmacist and a police officer. Images of bloodied scrubs, shoes and hospital rooms flooded social media after the NRA suggested doctors who support a ban on semi-automatic firearms should "stay in their lane." Dr. Regina Royan, an emergency medicine resident at the University of Chicago, tweeted a picture of an operating room with pools of blood on the floor: "I held this 22-year-old’s heart & used my hand to pump blood through a bullet-riddled body." "First patient, first day of residency: gunshot wound to the head," read one tweet from Dr. Brent McCaleb, a family medicine resident at Bayfront Health St. Petersburg, next to a photo of splashes of blood on his scrubs. Dr. Stephanie Bonne, a trauma surgeon with University Hospital in Newark, New Jersey, was also outraged by the NRA’s response. She shared a photo to #ThisISOurLane of her own operating room after a patient tragically died from a gun injury. "I mean are they kidding? Not my lane? Like, this is my highway. This is where I live every day. This is what I do every day," she told ABC News' "Start Here" podcast. The shooting hit even closer to home for Bonne, who trained at Mercy Hospital seven years ago. University Hospital treats more than 500 gunshot wounds a year in Newark, according to Bonne, but she stressed it's not just "urban centers" that are seeing these firearm injuries. The entire medical community is feeling the effects of the rising death toll from gun violence. "There's not a surgeon in the country that didn't do trauma as part of their residency, and part of their training, and hasn't been there to see a patient who's been shot and had to do a life-saving operation on them," she said to "Start Here." For years, the Centers for Disease Control and Prevention was barred by law from advocating for gun control and as a result did not publish much research on the topic. But last week, the CDC released new data, showing that after a decline in deadly shootings, gun deaths rose between 2015 and 2016, including 27,000 firearm homicides and 45,000 firearm suicides. 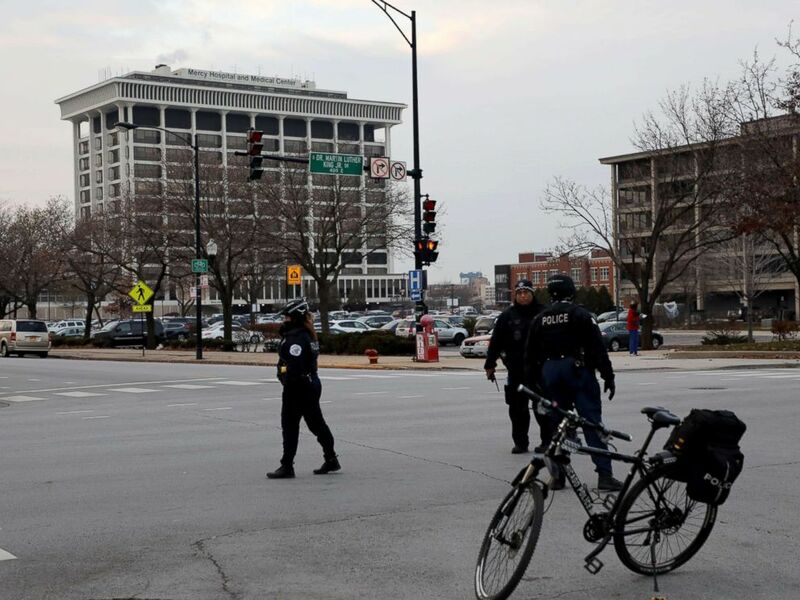 Police stand near Mercy Hospital, Nov. 19, 2018, after multiple people were reported shot on the Near South Side of Chicago. Instead of staying in "their lane," Bonne wants doctors to have a seat at the table in conversations addressing gun violence as a public health issue. "What I can tell you is that an AR-15 is far more damaging a bullet than a handgun bullet, so to the extent that that is useful to the conversation, then I belong at the table to say, 'Hey, these bullets damage a lot more than a handgun bullet and people die from them because the organ damage that's inflicted by [this is] far and above worse than what we see with ordinary ammunition in rifles." As doctors continue to share stories to #ThisISOurLane, Bonne believes more attention, and more research, will be focused on gun violence. "A lot of my colleagues have said recently ... for too long we've been sanitizing the problem," she told "Start Here." "Getting a bunch of doctors together to post pictures of their ... bloody scrubs and floors and everything else up on Twitter was certainly powerful." The NRA did not immediately respond to ABC News’ request for comment. This story is featured on the Wednesday, Nov. 21, 2018, edition of the ABC News "Start Here" podcast. "Start Here" is the flagship daily news podcast from ABC News -- a straightforward look at the day's top stories in 20 minutes. Listen for free every weekday on Apple Podcasts, Google Podcasts, iHeartRadio, Spotify, Stitcher, TuneIn, or the ABC News app. On Amazon Echo, ask Alexa to "Play 'Start Here'" or add the "Start Here" skill to your Flash Briefing. Follow @StartHereABC on Twitter, Facebook and Instagram for exclusive content, show updates and more!